February 1, 2012 by David Shields. Average Reading Time: about 4 minutes. In American Wood Type 1828–1900, Rob Roy Kelly writes the history of the major American wood type manufacturers of the nineteenth century. He describes James Hamilton as an “aggressive businessman” buying out his competition starting with the William H. Page Wood Type Co in 1891. While true—the sale was finalized on January 4, 1891—Kelly simplifies the subtleties of the situation. Hamilton started his business in 1880, and by 1887 was undercutting the competition with cheaper Holly Wood Type made with his veneer method of production. Situating the company in Two Rivers, Wisconsin gave him direct and easy access to the necessary raw materials quicker than the competition on the east coast. Perhaps most importantly from a business perspective, Hamilton was also assiduously developing a robust national network of distributors for his products that far outpaced the networks developed by his competitors. These three factors combined to give Hamilton the commercial edge needed to surpass the established eastern wood type manufacturers, and would allow Hamilton to effectively monopolize the manufacturing business by the end of the century. While it is not necessarily clear who initiated the buy-out talks, this letter, from William Page to William Baker (Hamilton’s business partner at the time), clearly indicates that it was the William H. Page Wood Type Co that pursued the merger. 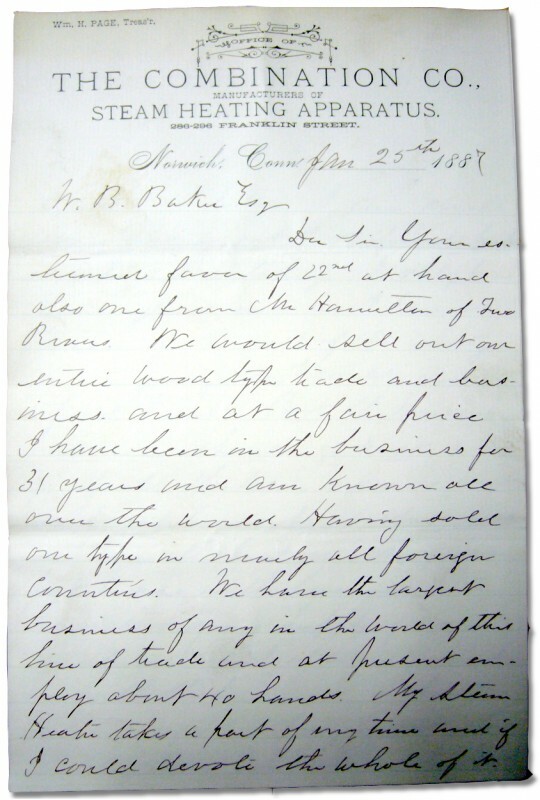 The letter also includes interesting details of his company’s prior acquisition of John G. Cooley’s wood type manufacturing concern in 1869. Combing through the boxes of early correspondence of the Hamilton Manufacturing Co held at the Hamilton Wood Type & Printing Museum is a treat in and of itself. But stumbling across a letter not even imagined to exist is an entirely different level of bliss. I discovered this gem hidden among other business papers of the Hamilton Mfg Co at the corporate archives of the Thermo-Fisher Co the current parent company of the now defunct Hamilton Mfg Co. These materials have since been moved to the archives of the Hamilton Wood Type & Printing Museum. and paid him $30,000 but we have only left of that purchase a “Daniel Planer”1 His machinery was too antique for us and his patterns were only duplicates of ours so we burned them for fire wood we did this to get him out of the way. It paid us well enough. ranged so it will be mutually agreeable all around. If we should not sell out it better be confidential between us. If we should of course it will be known. If Mr. Hamilton is a practical man he had better come out here and look and talk this thing over. It takes some capital to put our heater properly on the market and that is our reason for selling out this one. Shall be pleased when _____ from grace.